Without migration, the world as we know it would not exist. The first humans would not have left Africa, trade and industry would not have flourished, and today’s civilisations and religions would not have developed. All the world’s great cities have benefited from migrants, whose perseverance in the face of hardship and often prejudice has created the civic societies that we value and enjoy today. The 2016 Prize will be conferred to a mayor who has accepted the challenges posed by migration but is also convinced of its longterm benefits. He or she will be leading a city where past and/or more recent immigrants have contributed to the city’s society, economy and culture. The City Mayors Foundation, the organiser of the biennial World Mayor Project, will also consider a mayor for the Prize whose community has shown exceptional resilience during the recent arrivals from disaster-torn regions of the world. The City Mayors Foundation is looking for mayors who have recognised that people, whatever their origin, status or background, are the greatest capital the world has to offer. This year’s World Mayor Project will identify mayors whose cities have done the most to welcome immigrants and have used their skills to enrich and diversify society culturally, economically and socially. At a time when there are some 60 million refugees worldwide, mayors to be considered for the World Mayor honours will also need to have shown compassion, courage and competence. Compassion for people who have travelled great distances to find safety. Courage to fight prejudice even in the face of unpopularity. Competence to leverage the value and potential each person offers society. The City Mayors Foundation is now inviting you to nominate mayors who, in your opinion, have demonstrated these qualities. Please also consider whether your candidate is likely to agree to the City Mayors Code of Ethics. Nominations should be accompanied by a persuasive statement, outlining the mayor’s qualities and detailing the success of his/her city in integrating immigrants in the past and supporting more recent newcomers. You may also provide examples of contributions made by immigrants and challenges faced and mastered by towns and cities. By taking part in the 2016 World Mayor Project you are also recognising the efforts and sacrifices made by towns and cities as well as by many smaller communities, not just in Europe but also in many other parts of the world, in integrating and welcoming migrants and refugees. Please insert the name of your nominated mayor, his/her city and country as well as the year he/she became mayor. Please ensure that the mayor's first and surname is spelled correctly and that you indicate his/her gender. Please use the Western (roman) alphabet. Your comments must be legal, informed and fair. Multiple and manipulated votes as well as abusive comments will be deleted. If possible, please provide examples of contributions to the town or city of your chosen mayor made by past immigrants and/or more recent arrivals. If possible, please provide examples of challenges faced and mastered by the town or city of your chosen mayor by past immigrants and/or more recent arrivals and how the challenges were mastered. For your information: The World Mayor Project, organised by the philanthropic City Mayors Foundation since 2004, has no connection with any city or organisation and is run on strictly non-commercial lines. Sponsorships, advertising, subscriptions, donations or any other kind of revenue are NOT sought and will be rejected, if offered. Please contact us if you have any further questions. 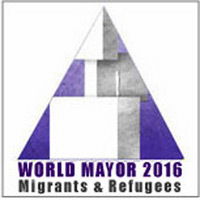 Please insert 'World Mayor 2016' in the subject line of any email. Thank you for participating in the 2016 World Mayor Project.